March | 2008 | NICE! Extensive collection of artwork from MoMA’s Design and the Elastic Mind exhibition with some 240 pieces. With such a mission to display this amount of work, a well conceived and executed navigation system has been produced. Each item is interlinked with varying categories and more detail can be seen. With such complexity the site is easy to use, and totally intuitive. The work in the site is amazing too, a really great website. 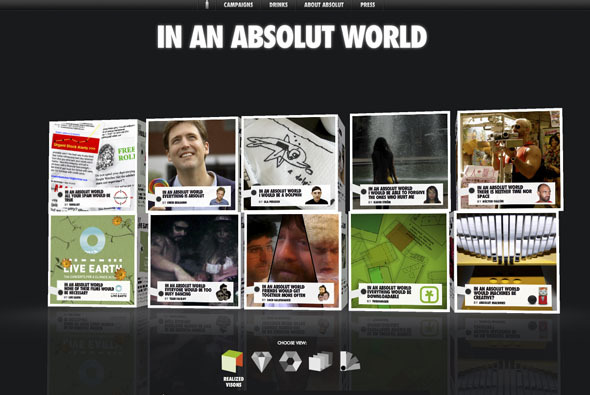 Created by the legendary tha ltd.
Another great Absolut microsite, promoting the visions of ‘an Absolut world’. Each vision can be opened up – the box unfolds -and shows a 3D animated vision. It provides a really nice user experience, and you can even upload your own. Really like the way the boxes open and reveal their contents – really cool. Lots more info here. Created by Greatworks with the help of Papervision creator Carlos Ulloa. Really cool website for The Vacuum Design. You float around their portfolio in 3D, demonstrating their style of work. There are some really great sites and motion design showcased here. 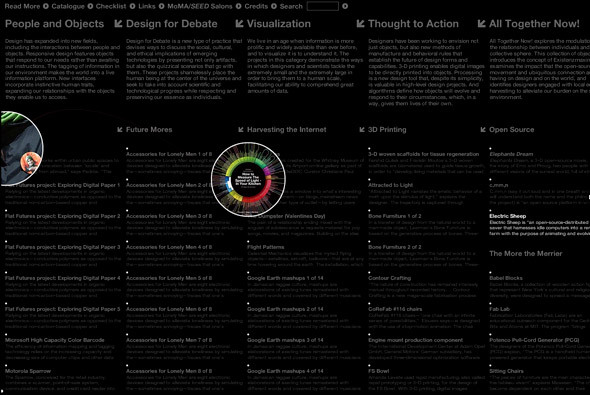 A great 3D website where the form really adds to the design – nice concept and nice design. Wow, incredible site for Red Bull promoting the Flugtag – an international event where people create flying contraptions and run off a large ramp into a lake! This is the interactive equivalent. You can design your own plane, edit other peoples, or use templates – you can paint it, choose what material the parts are made of and so on. 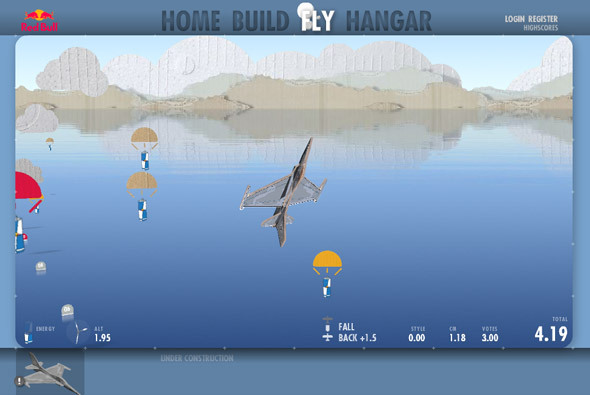 You then enter the flying arena where you take your design to the skies and perform tricks and try and get a high score. The attention to detail is incredible, created by Less Rain, as they write in their blog: “Flight Lab gives you the real thing: It’s a 6DOF (degrees of freedom) flight simulator modeled by a physics engine in 3D using rigid body dynamics. Real airplane wings can be described by specific lift and drag coefficients, depending on how quickly and from which angle the air flows over a wing section. 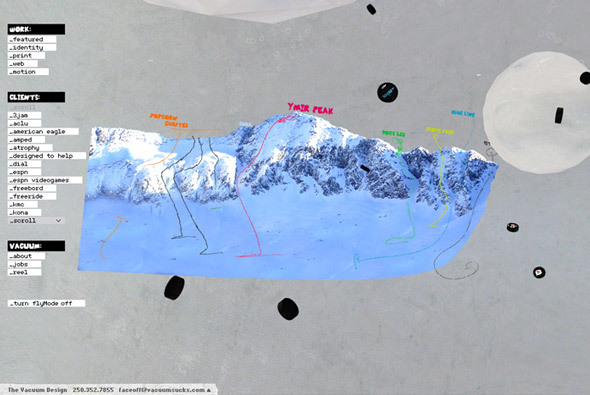 That’s what Flight Lab does.” Some great ‘making ofs’ can be found on their blog, part 1, part 2. Just a really amazing, ground breaking site, made in Papervision that really couples great design, usability and latest technology. I love the art direction and the concept has been well thought out and executed, really impressive!